Harriett Baldwin, Conservative Parliamentary Candidate and Green Action Organiser was on hand this weekend to enjoy the first radishes and a strawberry from a vegetable garden created by volunteers only weeks ago. In April, a team of volunteers had cleared and dug a vegetable garden for a Pickersleigh resident living on disability allowance. Thanks to a warm and wet few weeks, the patch is now bearing fruit - and vegetables. Harriett Baldwin said, "It was so rewarding to see the results of our hard work. It really shows how easy it is to get good results in our fine Worcestershire soil. Growing your own vegetables keeps you fit and healthy and helps the environment. I would like to thanks all the volunteers who came along for their hard work. Working together to help everyone in the area become greener really helps foster a sense of community. If anyone else is interested in volunteering, please do call us on 01684 573469." Steff Stowe, the Pickersleigh resident whose garden was transformed said, "I am really pleased with my new vegetable patch. I could not have achieved it on my own." 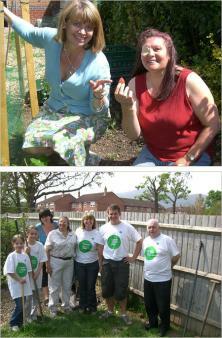 Photo: Harriett Baldwin visits Steff Stowe to inspect the first strawberry from her vegetable patch.